Over the last week of trading, the DAX30 CFD didn't deliver anything new in regards to the overall fundamental and technical picture. Technically, the German index trades within a range between 11,400 and 11,700 points. After the Fed rate decision, and the tendency for equity markets to trade high during the days leading up to the FOMC announcement, it seems as if a drift up to and above 11,700 points is more likely than the DAX30 CFD attacking the region around 11,400 before Wednesday. Nevertheless, the upcoming and eagerly anticipated meeting between US president Trump and Chinese prime minister Xi was postponed to April. Supporting the belief that, if Trump's tweets are to be taken as any indication, trade negotiations between the USA and China are not going, and any rising scepticism in response could push the DAX30 CFD down to the region around 11,400 points. With a break below 11,400 points, further losses down to 11,250 become very likely. Source: Admiral Markets MT5 with MT5-SE Add-on DAX30 CFD daily chart (between November 23, 2017, to March 15, 2019). Accessed: March 15, 2019, at 10:00pm GMT - Please note: Past performance is not a reliable indicator of future results, or future performance. In 2014, the value of the DAX30 CFD increased by 2.65%, in 2015, it increased by 9.56%, in 2016, it increased by 6.87%, in 2017, it increased by 12.51%, in 2018, it fell by 18.26%, meaning that after five years, it was up by 10.5%. Check out Admiral Markets' most competitive conditions on the DAX30 CFDs and start trading on the DAX30 CFD with a low 0.8 point spread offering during the main Xetra trading hours! The general picture for the US dollar remains mixed, in our opinion, though with a toppish touch. The drop in 10-year US yields left the USD index future failing to break higher to its highest levels since July 2017. In the coming days, all eyes will be on Wednesday's Fed rate decision, and whether or not the Fed will add further dovishness to the consistently dovish rhetoric of the last months. This seems especially interesting, after the likewise dovishly interpretation of the ECB we presented in our last weekly market outlook. On top of this, the news that the meeting between US president Trump and the Chinese prime minister Xi was postponed to April points to clear tensions in regards to ongoing trade negotiations. This could potentially result in further economic scepticism due to talks of an escalating trade war, which could likely result in an increasingly more dovish Fed. Don't forget to register for the weekly webinar "Admiral Markets' Weekly Market Outlook" with Jens Klatt, every Friday at 12pm London time. It's your opportunity to follow Jens as he explores the weekly market outlook in detail, so don't miss out! As with the USD, the overall picture for the Euro also hasn't significantly changed over the last week of trading. While the outlook for the Euro remains bearish, particularly after the last ECB rate decision to hold rates at the current level at least through 2019, the EUR/USD didn't break significantly below 1.1200, instead traded back towards 1.1300. The main reason for this lies with the weak performance in the US dollar and its yield sector. 10-year US Treasury bond yields have bounced back from their levels at the beginning of the month at 2.75%, and are about to push to the lowest levels since July 2018. Until the Fed rate decision on Wednesday, the picture for the EUR/USD stays neutral, while any rebound in the USD and USD yields could result in another push down to 1.1180/1200. If, on the other hand, the Fed doubles down on dovish rhetoric, the EUR/USD could sustainably stabilise above 1.1300, with further upside potential limited due to inherent Euro weakness after the ECB rate decision. Source: Admiral Markets MT5 with MT5-SE Add-on EUR/USD Daily chart (between November 29, 2017, to March 15, 2019). Accessed: March 15, 2019, at 10:00pm GMT - Please note: Past performance is not a reliable indicator of future results, or future performance. In 2014, the value of the EUR/USD fell by 11.9%, in 2015, it fell by 10.2%, in 2016, it fell by 3.2%, in 2017, it increased by 13.92%, 2018, it fell by 4.4%, meaning that after five years, it was down by 16.5%. Even though it seems at first glance that there's nothing new to discuss concerning Brexit, but the chances of an extension of the deadline and a 'Soft-Brexit' deal appear to have increased – at least in the eyes of market participants. They have pushed the pound sterling against the USD to its highest levels since July 2018. While Theresa May still found no majority for her deal last Tuesday, being voted down 242 against 391, parliament also followed up by rejecting a no-deal Brexit on Wednesday. Now, they are seeking an extension of the Brexit deadline beyond March 29. While the amendment is not legally binding, and does not alone change the deadline, a tweet from European Commission president Tusk suggests that also the EU is also in agreement to not let the UK leave without a deal. With a potential extension of the Brexit deadline in mind, and both sides obviously favouring a deal (even though the EU clearly follows the UK's lead in this case), the GBP currently seems undervalued, particularly relative to a weak-seeming US-Dollar. 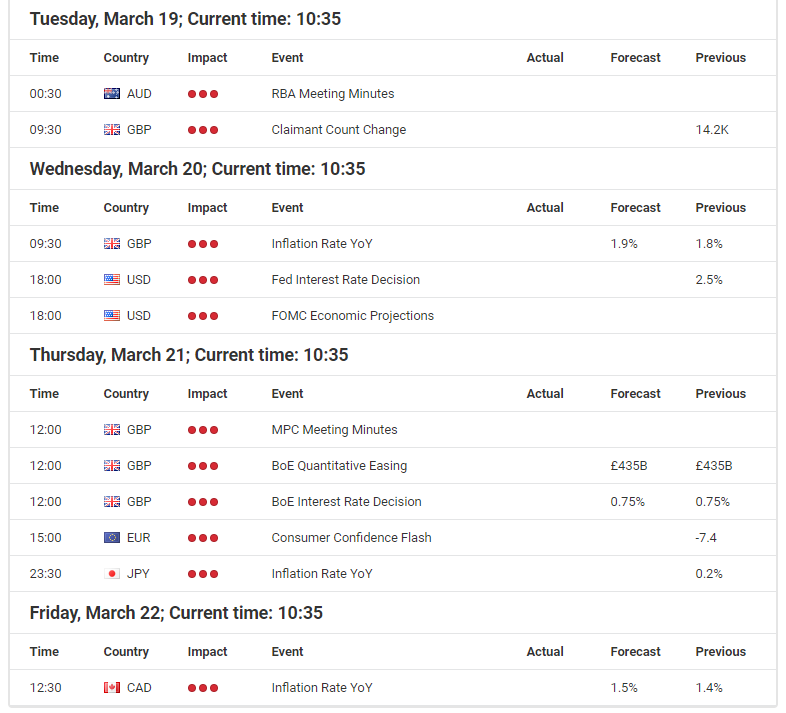 That said, a break above 1.3350/3400 in the coming days seems likely, and if upcoming economic data from the UK over the coming week (employment on Tuesday, inflation on Wednesday) convinces the BoE to keep the 'wait-and-see'-approach through to next Thursday, a push up to 1.3600/3650 seems likely. From a technical perspective, this bullish scenario stays intact as long as the GBP/USD trades above 1.2950. Source: Admiral Markets MT5 with MT5-SE Add-on GBP/USD Daily chart (between December 12, 2017, to March 14, 2019). Accessed: March 14, 2019, at 10:00pm GMT - Please note: Past performance is not a reliable indicator of future results, or future performance. In 2014, the value of the GBP/USD fell by 5.9%, in 2015, it fell by 5.4%, in 2016, it fell by 16.3%, in 2017, it increased by 7.4%, in 2018, it fell by 5.6%, meaning that after five years, it was down by 22.9%. In our last weekly market outlook, we discussed a still bullish outlook for Gold and the chance of a short-term bounce back above 1,300 USD (which occurred), while also recognising remaining scepticism around the yellow metal (which came to be justified during the second half of last week). For the days to come, it looks like we should be still very careful when approaching long engagements in Gold. While, in our technical opinion, a break below 1,275/277 USD is a clear bearish sign, and activates a target around 1,240 USD. In response to news that the meeting between US president Trump and the Chinese prime minister Xi was postponed to April, indicates clear tensions in regards to ongoing trade negotiations, and the short-term positive correlation between the Chinese Yuan and Gold could weigh on the Gold price. If Gold bulls can hold the precious metal above 1,275/277 USD, and push it back above the pre-weekly highs around 1,310 USD, further gains up to 1,330 USD become an option. This would be doubly true if the Fed expands upon dovish policy rhetoric at next Wednesday's meeting. Source: Admiral Markets MT5 with MT5-SE Add-on Gold Daily chart (between December 13, 2017, to March 15, 2019). Accessed: March 15, 2019, at 10:00pm GMT - Please note: Past performance is not a reliable indicator of future results, or future performance. In 2014, the value of Gold fell by 1.7%, in 2015, it fell by 10.4%, in 2016, it increased by 8.1%, in 2017, it increased by 13.1%, in 2018, it fell by 1.6%, meaning that after five years, it was up by 6.4%. This is a marketing communication. The analysis is published for informative purposes only and are in no way to be construed as investment advice or recommendation. It has not been prepared in accordance with legal requirements designed to promote the independence of investment research, and that it is not subject to any prohibition on dealing ahead of the dissemination of investment research. Each of the Analysis is prepared by an independent analyst (Jens Klatt, Professional Trader and Analyst, hereinafter "Author") based on the Author's personal estimations.